페니케, 포르투갈의 RIDE - Surf Resort & Spa | 호스텔월드에서 예약하세요. Perfect balance between comfort, nature and the adrenaline of sports. The spot to be for all travellers: individuals, families and groups. Whether you are just looking for relaxing moments in our Spa or a week full of adrenaline and adventure, at Ride we have it all! 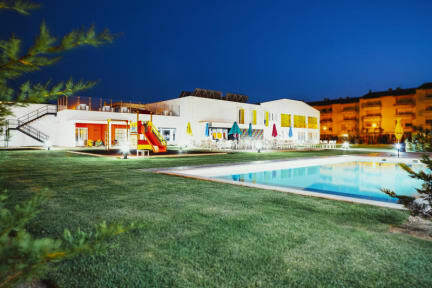 Ride Resort has a unique and privileged location in Baleal, just 400m away from the beach, close to nightlife, restaurants and various cultural venues. Our resort is the only one in Portugal that allows guests to join group or private classes in 3 different sports: Surf, Skate and Bike.Ride Resort also features 22 elegant and comfortable rooms, a total of 94 beds, with the particularity of having SPA mattresses to provide our Guests unforgettable nights. We have 3 types of room categories, suitable for guests traveling alone, with friends, romantically, with family or team buildings and incentives. 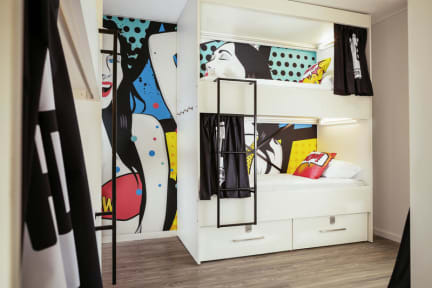 Double or twin rooms; Double Ride rooms - ideal for families (maximum of 4 people) and our shared rooms (maximum of 6 people), thought and prepared for groups or simply for Customers who wish, for a great price, to share a room and meet new people. All our rooms, including the shared rooms, have a private bathroom. Our resort has 7,000 sqm of area, of which 5,000 sqm of outdoor area, with an Outdoor heated swimming pool, Solarium with sun loungers, Skatepark; Climbing Boulder; Volleyball net; Slackline and Playground. Visit Ride Resort and enjoy our Restaurant wOw with capacity for 80 people, Le Pop Bar with living room and Games Room or even our Rooftop with 500 sqm. Additionally, if you want to relax or exercise, we recommend our Gym and Spa (sauna, Turkish bath and 2 massage treatment rooms) as well as our Yoga classes. Do not forget our Surf, Skate and Bike academies, with private or group lessons available, for all levels and for any age or, simply, bikes, skates and surf equipment to rent. Use for free our drying room for surf suits - unique in the region. We also have the ideal space for your events, with a meeting room with capacity for 60 people, free Wi-Fi in all areas of the resort and all the services needed to make it a success.